Thank you for granting my request! It seems that I’ve been focusing a lot on the weather lately. Well, I’ll just go with it. 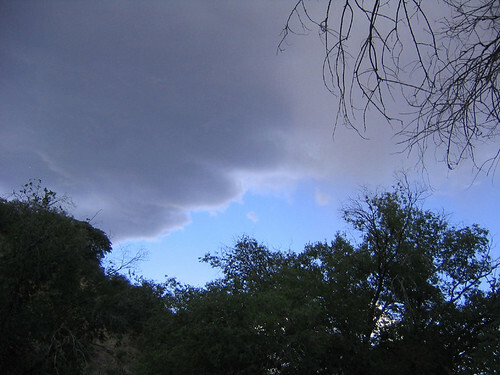 The clouds gathered ominously throughout the afternoon, and finally let loose with a magnificent thunderstorm around 5:30. It cooled everything off nicely. Ah, blessed cool, moist air! CRASH! BOOM! ZAP! POW! No, it’s not something out of a comic book. This is real-life weather drama. Luckily, not too dramatic; just enough to send shivers down my spine as the lightning was almost immediately followed by loud claps of thunder, so James and I knew that it struck very close by. Here is my very first upload video to YouTube. I’m amazed that I was able to figure it out. My video camera’s battery was dead but luckily my digital camera was functional. I just now received a phone-call from the producer of the HGTV show, “What’s Up with THAT House?” telling me the air-date of the episode featuring our Bisbee “Knick-knack House”! It will be on Wednesday, August 22, 2007 at 11:30 pm (Eastern and Pacific time) and at 10:30 pm Central time. I’m so excited! I hope that you can all tune in, and please comment on the post I will be writing that day. I’ll probably post a reminder a few days beforehand. Monsoon season, please come SOON! Since I’ve switched to this new blog, it seems that I’m getting a lot less traffic. There are a few commenters from the old blog who are now leaving comments on this one, which I greatly appreciate. I do hope that my other readers will follow suit. Please feel free to blogroll “Living in the Woods”. I’m not quite in the woods yet (a twist on that old phrase!) but will be by the end of the summer. Thankfully it’s a bit less hot today; “only” in the low-90s now at noon. 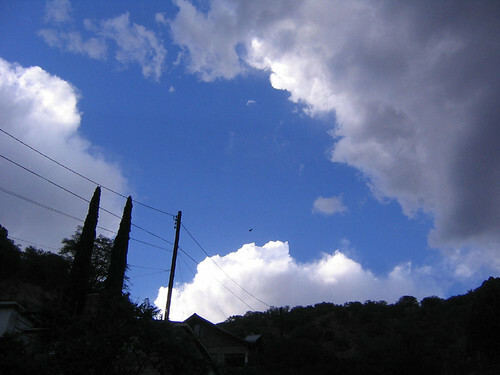 Monsoon season draws ever nearer, with clouds accumulating by late afternoon. It’s already starting to get overcast now. Next door neighbor Martha sat with me as the clouds tried to threaten rain. Horizontal zig-zags of lightning streaked across the sky, and the faintest hint of moisture grazed my face. Martha suggested that we do a rain-dance, but I was too lazy. 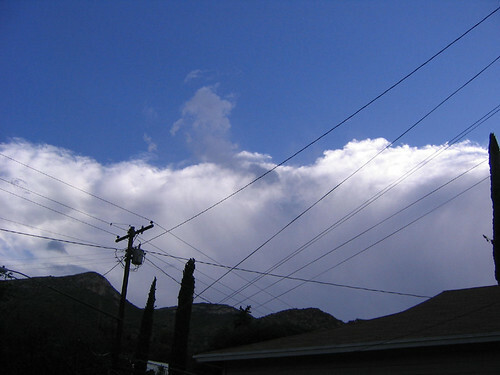 “I’m sure someone in Bisbee is doing exactly that right now, anyway”, I said, staying in my lawn-chair sipping a beer. The sky gradually clouded over completely and we were refreshed by a few drops of rain, but the heat prevented much from hitting the ground. 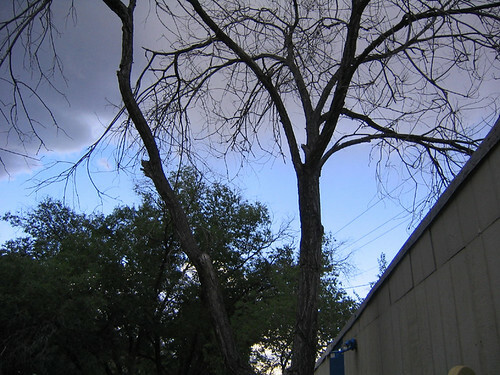 The almost-storm passed quickly, but at least the temperature dropped a few degrees. This hot weather is actually making both James and me ill. However, we feel well enough to continue our packing! It has been blazing hot in Bisbee these past three days. Fortunately, Caroline left before the heat cranked up full-blast. This was the kind of weather I had warned her about before she arrived, so we were all pleasantly surprised to find that it wasn’t that bad while she was here. But the temperature has shot up an average of ten degrees since her departure — and the forecast calls for continued heat through the Fourth of July. According to The Weather Channel online, it is 101 degrees right now. I think that TWC gets its Bisbee readings from nearby Sierra Vista, however, which is down in the valley and is always warmer. The weather report on my “Dashboard” (a feature of my Mac operating system on my laptop) reads 96 degrees. So I usually split the difference to get a reasonably accurate temperature reading for Bisbee. Yesterday was even hotter; it definitely reached triple-digits. These are the dog-days of summer, before the cooling monsoon thunderstorms come each afternoon starting in mid-July. 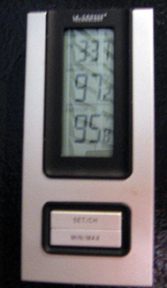 In the living area of the “apartment” side of our building, it is even hotter than outdoors! This is because we removed the ceiling when we first moved in five years ago; it was falling down anyway. 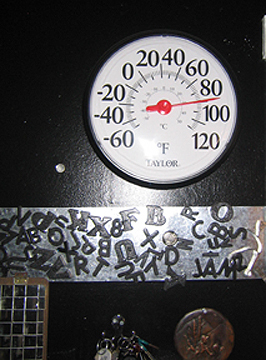 The room is like a furnace in summer and a freezer in winter. James and I were just discussing that if we had decided to continue being residents of Bisbee, we would need to leave town each summer for cooler climes. A lot of people do this; they stay here from November through May, then go elsewhere the rest of the year. I want to live in a place where we don’t have to migrate. It will be very interesting to see how we do in the woods of Northern California, where it will definitely be colder in the winter, but at least bearable in the summer — if fires don’t get us first! I’ve just about caught up on my sleep after Caroline’s visit. We certainly put out a lot of energy over those five magical days, and I partied more than usual. Yesterday was spent mostly resting, with a few short sessions of horn practice. It’s amazing how quickly the lip muscles weaken when I take a few days off. My low energy level is also due to the high heat this week, with temperatures in the upper 90s, creeping towards 100 in a few days. This is slightly cooler than other parts of Arizona, at least, but our house is not insulated and the inside temperature reaches 90 degrees in some rooms. This really zaps me. We’ve got a wall-banger air conditioner in the bedroom on one side of the house, and a large portable one in the salon (with the grand piano) on the opposite end. This is where we are currently hanging out. Luckily, the units keep these rooms passably cool, but we have to keep the a/c running constantly. I shudder to contemplate our next electric bill! In the desert, the sun is so bright and intense that it’s best to stay indoors until it dips behind the canyon late in the afternoon. Or if one must go out, wearing a large hat and sunglasses and staying in the shade as much as possible is highly recommended. Yesterday, James removed all of his stock from his “junque” shop portion of the building he shares with Jody (hairstylist). It was quite an undertaking, since he gave away some of the stuff to various friends and delivered it personally, while other items went to the thrift store, and then he brought some things home. He spent much of the day doing this, and feels slightly relieved that the process of moving out of Bisbee has truly begun. I feel like a “lame duck” here in town, now that most people know we’re leaving, but we’re still here for probably another five weeks. It is interesting to gauge people’s reactions. Except for our very good friends Cynthia and Cowboy — who express genuine regret that we’ve moving — everyone else seems to be reacting defensively. They think James and I are slapping Bisbee in the face (when in fact we’re not; it’s simply not a good “fit” for us, personally) and somehow, our leaving brings up all sorts of stuff for them. It hits them where they live, so to speak. It IS indeed challenging to make a living in this town, and I believe that many people here have a tough go of it unless they are independently wealthy. So it makes sense that they are defensive, a by-product of fear. Initially I enjoyed the potlucks. Everyone seemed so friendly! Soon enough, however, I realized that much of this was just surface interaction. As James and I attended more and more potlucks, we started noticing that the above patterns were recurring over and over, with little variation. It was like each potluck was a replay of the previous one. I repeatedly tried to get to know people better, digging deeper into their lives. But they never respond with anything beyond the usual surface platitudes and “first-time-I-saw-Bisbee” stories, which we’ve already heard ad nauseum. One of the most notable patterns in these social gatherings is how no-one seems at all interested in James’ or my lives; they ask us very few questions unless it pertains to them or the town. It is not my intention to have a “sour grapes” attitude about Bisbee. As this process of discovery and living here has unfolded over the past few years, I realize that my perceptions about the town and people were actually in place almost as soon as we arrived — but I dared against hope that I was mistaken. Well, I wasn’t. The glimmers of doubt have turned out to be true. For us, anyway. James and I brought Caroline to the potluck last Friday night, her final evening in Bisbee. Perhaps my current state-of-mind has irretrievably colored my world, but it seemed that this potluck was particularly unpleasant. People stared at us in an unfriendly way and gave off unwelcoming vibes, as though they didn’t want to be approached. I could tell that many of them already know about our imminent departure, but they didn’t ask us any questions. Nothing about how she was going to miss us. She snarled at James, “Is it about money, then?” He assured her that it was not. “You just didn’t give Bisbee a chance!” she retorted. Caroline and I exchanged glances and we simultaneously rose from our chairs and left the deck. I gestured to James that we should go, which we did shortly afterward. Ugh. That’s the last Bisbee potluck I ever want to attend. James and I drove Caroline to the Tucson Airport yesterday noon, putting her on a plane for LA for her final phase of her American visit. I cannot adequately describe the fun and joy we experienced during her whirlwind 5-day stay in Bisbee! I’m sitting here trying to remember everything we did, but it is all a pleasant blur now. It is more important to focus on the overall effect of Caroline’s visit, which was full of laughter, hugs, singing, eating, and hanging out with James’ and my two closest friends here (Cynthia and “Cowboy”). A great time was had by all. We discovered that it really is possible to meet wonderful people through the internet. Caroline and I first met on the Mac music site “Macjams” exactly two years ago. We went on to communicate via Instant Messenger (called iChat in Apple lingo), email and Skype, sharing our writing, our pictures, our voices. It seemed that we knew each other very well, even before finally meeting in person a few days ago. Making such a powerful, loving connection in-person is a wonderful validation of the good aspects of the internet. It IS possible to meet truly wonderful people online, and Caroline’s success at attracting many new friends — who she has gone on to visit, both in the UK and in the States — serves as perfect testimony. Caroline, I trust that you are having a wonderful time with your online-and-now-in-person friends in Southern California. James and I are feeling a bit let-down and anticlimatical now that you are gone, but this is not bad and is to be expected. We look forward to our next visit, whenever and wherever that happens to be! Caroline is here and we’re having a wonderful time. She’s even more lovely in person; she radiates such love and positive energy. James and I felt comfortable with her right away, and we’ve been chatting and laughing nonstop from the moment she trundled down the gate with her “pink and fluffy” suitcases. Pink and fluffy is Caroline’s motto. She loves everything pink; even her SmartCar is that color! So it was easy to pick her out in the crowd of passengers disembarking from the plane. Caroline managed to snag the last seat on the last flight from Phoenix to Tucson, arriving only an hour later than originally scheduled. This gave James and me time to stop by Tar-jay (you know what I’m talking about!) for a few supplies. The Tucson airport is a laid-back affair, resembling more a bus station than an airport. The pace is slow and the volume low. Almost pleasant. There is a greeting area well away from the security gates, with a large video screen showing the arrivals emerging from the planes. I focused my video camera on this monitor, waiting for Caroline’s arrival. James spotted her first, because of the bright pink suitcases. I filmed her briefly as she walked towards the escalator, then tossed the camera to James so that he could film me hugging Caroline for the very first time. We’ve both been basking in her warmth ever since. The trip back to Bisbee flew by in a pleasant blur, as James and I pointed out various sights. We stopped at the Continental Divide, immediately over the tunnel, to look at the stars showing brightly in the clear, black sky. The cool evening desert breezes brushed our faces as we gazed at the heavens. Conversation stopped as we were enveloped in the silence, broken only by an occasional howl of a coyote in the distance. I had forgotten what an impact it is to approach Bisbee by night, the lights of the miners’ shacks and grand buildings downtown twinkling on the hillsides. No wonder there are so many pictures of the town on Flickr and so many Google hits. It’s always interesting to gauge newcomers’ reactions to our house, inside and out. Caroline was amazed at all the objects plastered on the walls and little red toys scattered on every surface in our main living area. She wandered from room to room, exclaiming over each new discovery. It will take her all week to see everything, I suspect. James made us a late-night snack of nan (Indian bread) sprinkled with olive oil, herbs and bits of tempeh. We washed it down with glass after glass of mint sun-tea as we chatted and laughed into the wee hours of the morning. It was difficult to tear ourselves away to sleep at nearly 2 a.m. So here I am trying to put words together in the midst of three MacBook laptop computers clacking away — James, Caroline and I each have one — Caroline just finished a video conference with a dear friend in England, gave a quick tour of the house…James is surfing the Net…we’re all sipping on coffee…and we are about to walk a short block down the street for brunch at the High Desert Market. Having Caroline here is healing on many levels. Not only is it wonderful to be with her in person, but her presence is helping us shift our view of Bisbee into a more positive light. This is extremely welcome after feeling a bit down about the place lately. I’m also glad that Caroline gets to see this picturesque town before we leave. Right now I’m feeling like a master of disguise, a shape-shifter, constantly changing my spots and coloration to keep one step ahead of the Small Town Thought Police. I could have continued to write in my previous blog, really, but this whole tiny-town-gossip-thing has grown tiresome, and I want to MOVE ON! However, I will respond to comments to my latest blog entry there, and haven’t totally ruled out the possibility of writing additional posts before James and I leave. But I must admit that I’m much more excited about looking towards James’ and my future life in the woods of Northern California rather than dwelling on this place. In this new blog I can write more freely about my current thoughts, frustrations, hopes and aspirations without everyone here knowing my business. Hooray for that! But I am feeling so much better now, with this clean slate. My online friend Caroline, who is British and lives in the UK, is flying in this evening to visit us for five days! She’s on a month’s visit to the States, concentrating on the western US this time (a few months ago she visited the East coast). James and I are both very excited about finally meeting this woman in person, after more than two years of emails, exchanging videos, instant messenging and phone chats. I feel that I know Caroline very well already, and anticipate that we will get along wonderfully in person, but we won’t know for sure until we spend time in each other’s company. It is interesting that she comes to visit us during a rather difficult, awkward time in James’ and my sojourn in this small town — (Gosh, I’m even hesitant to use its name now!) — especially after singing its praises for so long. But we will make the best of the situation and I hope that Caroline’s presence will improve my attitude. One of two close friends in town, Cynthia (who I’ve referred to often in the other blog) is having us all over for dinner tomorrow night, which will be fun. I hope it will be a small gathering, unlike most of the parties here. Sometime this week, I will be helping James and Caroline record the song they worked on together two years ago. It will be much easier for them to perform their “give and take” lyrics live and in-person. I think it’s going to be a really great song. Very clever. Perhaps we’ll take Caroline to some of the local tourist attractions which we’ve avoided like the plague thus far, such as the Queen Mine tour and the Mining Museum. It reminds me of my high school years in the Washington DC area, when we never saw the sights until out-of-town guests arrived. Caroline called an hour ago to say that she missed her flight from LA to Phoenix; her itinerary listed the wrong terminal and by the time she finally arrived at the right building, her flight had already left. So this throws everything off a few hours. Hopefully she’ll be able to catch the next one, and the second one to Tucson. She’s flying stand-by on both. We’ll keep our fingers crossed! This delay is not entirely unwelcome, as James and I were rushing around all morning cleaning the house — twice a year whether it needs it or not — and it’s nice to have a couple of additional hours of down-time before making the hour-and-forty-minute drive to the Tucson airport. Well, this new blog already feels quite different from the other. I hope it’s not too mundane!